Are you coming back to yoga after a long time? Are you creaky, overweight, stiff as board? Are you flexible, adept, and practice yoga regularly? Are you looking for peace and nourishment in yoga? Are you worried you wont do well with yoga? We welcome you! Were here for you. You are perfectly okay and yoga is for you. Weaverville Yoga is your yoga studio. At Weaverville Yoga we offer a variety of ways of practicing yoga - because human beings are varied. The common thread, the yoga mala, of what we teach is that our way is based on compassion, kindness, inclusion, and commitment. The heart. From the moment students step inside the door, they notice a sweetness that is not found elsewhere. This is because our classes are centered on the heart – on awakening the heart. 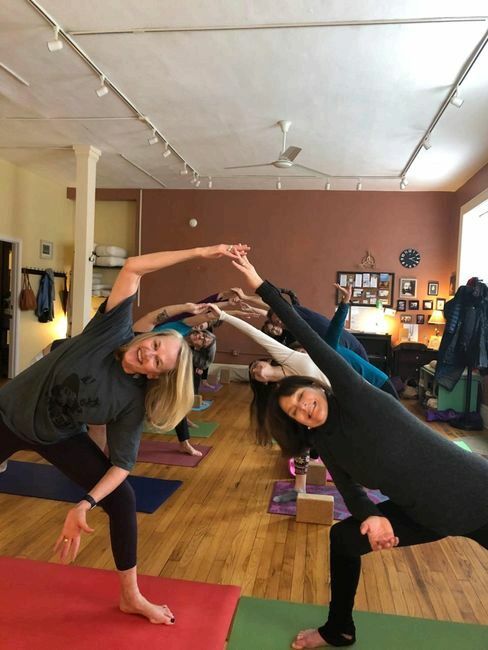 Whether Yin, Kundalini, Anahata, vinyasa, ballet barre, therapeutic, restorative, Inbound, or gentle yoga our teaching focuses on awakening the heart center, the Anahata chakra. is to create a safe, kind, pure atmosphere for people of all kinds to grow and learn through the regular practice of yoga. We are here especially for people new to yoga, anyone who can use yoga to feel better, and those who will thrive with the restorative, therapeutic, and gentle aspects of yoga we teach. We work with love and respect to support and encourage our students. We work on ourselves through a consistent, honest yoga practice as part of our lives as teachers of others. For our students: This studio is a place of refuge where you can feel safe in transforming yourselves. Whatever path has led you to our door, we welcome you wholeheartedly. We are happy to offer you our best.